A sculpture of a pair of feet made from wood, canvas, tea and coffee has won this year's Threadneedle Prize. Ben Greener's piece, titled My Feet, beat five other works to win the £30,000 prize - the most valuable in the UK for a single work of art. Sculptor Robert Truscott was awarded the £10,000 Visitors' Choice award for his large-scale work, Defeat. The prize was voted for by members of the public who visited the Threadneedle exhibition in London. Truscott's work, which depicts a line of captured German soldiers during the battle for Stalingrad, collected 13% of the vote. It is the first time winner Greener has entered the Threadneedle Prize and the first time he has ever exhibited any of his works in public. 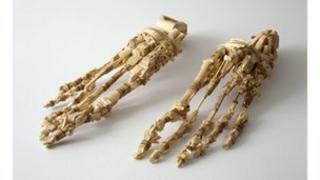 My Feet is one of a series of anatomical studies the artist has created from wood which also includes hands, a skull and a spine. The piece is currently listed for sale on the Threadneedle website for £1,500. There were more than 4,000 entries for this year's prize. The other five shortlisted artists included Elaine Brown, David Firmstone, Ben Hendy, Chloe Le Tissier and Sophie Levi. Judges on this year's panel included National Gallery curator Christopher Riopelle. The Threadneedle Prize exhibition is open at the Mall Galleries in London until 13 October.